Msgr. 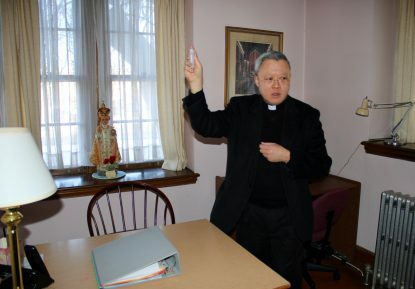 Joseph Trinh, pastor of St. Helena Parish in Philadelphia, on Monday, March 20 formally blessed space within St. Helena Convent that will be used to support programs for the aged — and but most topical, ESL/ESOL (English as a Second Language/ English for Speakers of Other Languages) as well as classes on the naturalization process for immigrants. Because St. Joseph’s feast day was celebrated on March 20 this year, Msgr. 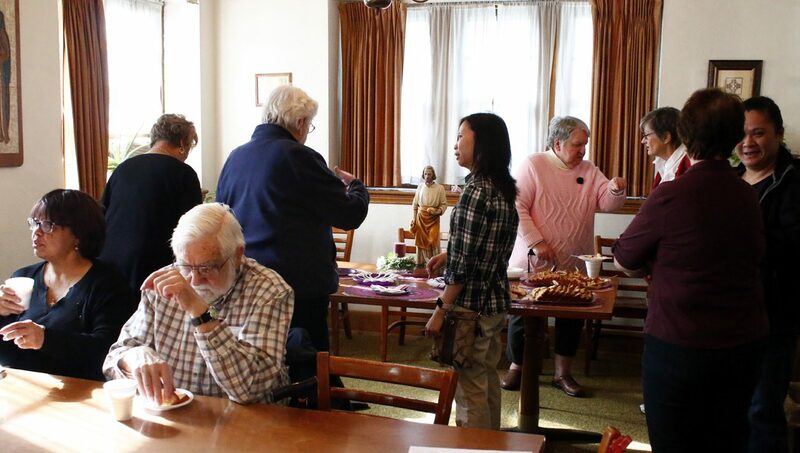 Trinh also at the same time led a small group of Sisters of St. Joseph in the annual renewal of their vows. That was appropriate too, because the new center is the brainchild of St. Joseph Sister Marie Albert, who served as principal of St. Helena School for 17 years and seed money for the project has been obtained from the Sisters of St. Joseph of Philadelphia. “It’s a commitment we have to the people here, reaching out to immigrants and refugees, people who are vulnerable in our society,” said Sister Jane Field, who represented the congregation at the ceremony. St. Helena, located in the Olney section of the city and founded in 1924, has always had in immigrant flavor. In the beginning many of the parishioners were of German extraction. More recently Asians, especially Vietnamese, along with African Americans and Hispanics have joined the mix. The sisters of her congregation also run a similar center across the city in Kensington. The Sisters, Servants of the Immaculate Heart of Mary run outreach centers offering English as a Second Language at St. Bernard Parish in Northeast Philadelphia, St. Francis de Sales in West Philadelphia and another in Coatesville. Other religious sisters continue offering English education at many other parishes in which they servein the Philadelphia Archdiocese. Probably no one knows better the need for outreach to immigrants than Msgr. Trinh himself. He arrived in Philadelphia from Vietnam in 1983, eight years before his ordination, and knows well what it is like to be in an immigrant in a strange new land. As the Outreach Center develops, it will rely on willing volunteers, mostly from the parish itself. Norajean Flanagan Glenn was raised in St. Helena’s but moved away for a time and came back in 1999. She is serving on the board of the Outreach Center and intends to be actively involved in the work. Another volunteer is Anh Nguyen, who came to America and Philadelphia at a young age 25 years ago. Hundreds of recent arrivals or anyone who celebrates their cultural heritage are expected at the 20th annual Cultural Heritage Mass on Saturday, March 25 beginning at 1:30 p.m. at the Cathedral Basilica of SS. Peter and Paul in Philadelphia. While he was at the convent, Msgr. Trinh also blessed the parish food cupboard in the convent basement. It is so large it could easily be a corner store, but that’s another story. 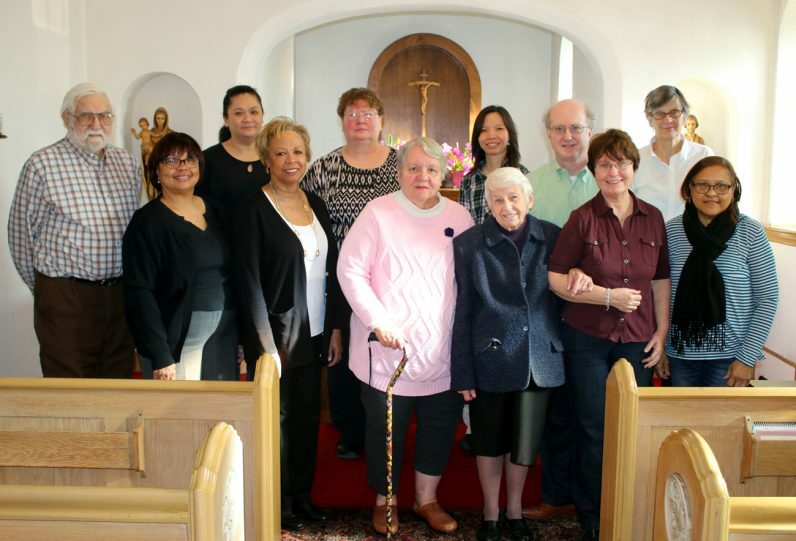 Sisters of St. Joseph, committee members and volunteers of the Outreach Center pose for a picture in the convent chapel.